According to a national survey, 68% of households in America have pets. In recognition of this fact, some apartment communities allow residents to move in with their furry friends. But does this mean that these communities are pet-friendly? 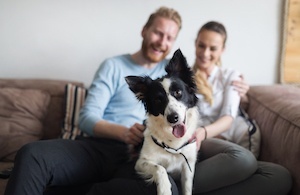 Here's a look at how our pet-friendly Springs luxury apartment communities truly consider Fido and Fluffy as members of your family. All communities that allow pets have some type of financial charge included in the lease. Pet fees are one-time non-refundable payments made upon move-in or when you bring a pet into your home. Pet deposits, like regular deposits, are paid upfront to cover potential damages to the apartment. Any balance is refunded at move-out. Pet rent is a nominal amount paid each month along with regular rent. Communities that allow pets will generally include cats and often dogs as well. Some allow fish and birds, but the list usually ends there. Springs recognizes that the definition of "pet" expands well beyond the traditional types. We welcome ferrets, lizards, hedgehogs, rabbits and a number of other animals that are not permitted in other communities. In addition, most apartment communities have a strict weight limit for dogs, while Springs has a more generous policy. We also accept more dog breeds than other communities allow. We make the comfort and convenience of our residents a priority, and that includes our animal residents. All of our Springs luxury apartment communities include on-site pet amenities, such as leash-free dog parks and pet spas, that won't be found at communities that simply allow pets. We're proud to have responsible pet owners as residents of our Springs communities, and we're committed to preventing any inconvenience to other residents. Springs uses PooPrints pet waste management service and DNA testing to ensure that our grounds stay clean. Our Springs on-site management teams are happy to answer any questions you may have about our pet-friendly policies. Share your funny pet stories with us in the comments!